Matluba Hakimova during her training at AUCA in 2018. Photo: Aikanysh Jeenbaeva. All rights reserved. I first met Matluba Hakimova checking in for a flight at Manas Airport in Bishkek. 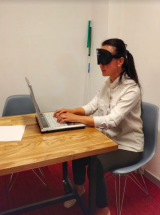 Though blind, she proceeded to register for and board her flight effortlessly, without any assistance. Matluba is originally from Isfana, in Kyrgyzstan’s southern Batken region that borders Tajikistan and Uzbekistan. That day, she was flying home. 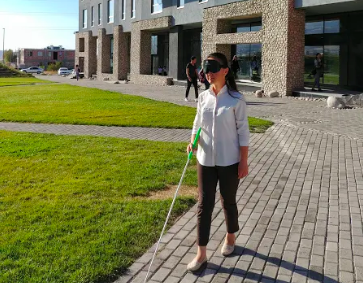 Nowadays, however, there is a Kyrgyz Society for the Blind and Deaf, as well as educational centres such as the Equal Opportunities Centre and the Phenomenon Public Foundation. Since 2010, a blind MP sits in Parliament. Elected first in the Ar Namys party, Dastan Bekeshev is now a deputy for the ruling Social Democratic Party and uses his position to lobby for the rights of disabled citizens.